observer. For example, dancers honoring the god Kane, whose kino lau (body form) is fresh water, may dress in colors and patterns that imitate water, and wear adornments of shells. The notes on dress and adornments that follow are very basic. Dancers of both sexes can wear pa`u (skirts). In ancient times, these were made of kapa (bark cloth), and often elaborately decorated with stamped and painted patterns. Nowadays most people make pa`u from woven cloth, and dye, paint, or silkscreen patterns onto them. 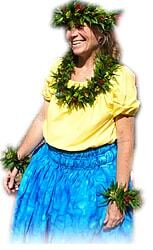 In ancient Hawai`i both men and women usually wore nothing above their waists, but modern sensibilities do not permit women to dance hula in this traditional way, so female dancers usually wear a mu`umu`u, pareau, or other breast covering costume. Dancers also make pa`u of materials such as ti leaves, lauhala (dried leaves of the hala (pandanus) tree), `ilihau (processed bark of the hau (Hibiscus tiliaceus) tree), and even cellophane. In ancient times, male dancers often wore only a malo (loincloth). This type of costume has recently become popular again. 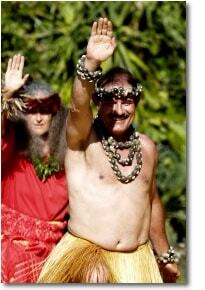 For modern hula, men usually wear trousers, sometimes with a ti-leaf, lauhala or ‘ilihau skirt over them. They may choose to wear shirts, but this is not obligatory. Both men and women adorn themselves with lei and kupe`e. Lei encircle necks, heads, and sometimes hats. Kupe`e decorate wrists or ankles, drawing attention to the delicate movements of hands and feet. Besides their obvious ornamental function, lei and kupe`e play other important roles. Often these are made of plants or other materials (shells, feathers, fibers etc.) that represent deities honored in dance. Some kupe`e create sounds that enhance the performance. Lei and kupe`e of fragrant plants such as laua`e fern also appeal to the sense of smell.